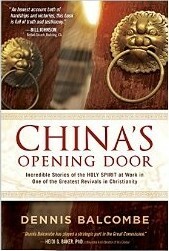 1 edition of China’s Opening Door found in the catalog. Add another edition? Are you sure you want to remove China’s Opening Door from your list? Published September 2, 2014 by Charisma House in Lake Mary, Florida, USA . When the Chinese government opened the country to foreigners in early 1978, Dennis Balcombe jumped at the chance to visit. After basing his ministry out of Hong Kong for nearly ten years, he was eager to finally proclaim the gospel in the country he had come to serve. In less than a year, he was meeting house church leaders and supplying them with Bibles for inland distribution, a path that would eventually lead to his arrest. In China’s Opening Door he shares his story, bringing to light the tremendous move of God that has been happening in the country. Filled with incredible accounts of miracles, Bible delivery, daily persecution, and even imprisonment for preaching the gospel, the book serves as an inspiration to believers everywhere about the power and faithfulness of God. The book also issues a challenge: those who live for God will suffer persecution when they stand up for the truth. Had these Chinese house church leaders submitted to the government’s regulations, they would not have gone to prison, and there would have been no persecution. But the tens of thousands who eventually became Christians would still be in darkness. September 8, 2016 Created by Todays Martyrs Reviewer Added new book.